How do I build a mobile app? In a world where the mobile app is pretty much found it’s way into every business and entertainment sector, companies are finding it increasingly necessary to join the party. On a weekly basis we have clients approach us with their ideas and dreams of bringing their mobile app(s) to life – some as an extension of an existing business and sometimes as a totally new and unique startup opportunity. Like pretty much every project across the globe, large or small, the key to building a mobile app is in the planning. Unfortunately, there are no shortcuts to well detailed and structured plans for the development team to follow. Don’t put enough time or resources into the planning…. and the results can range from disappointing, to catastrophic, with time and money thrown down the drain. The carpenter’s tip of “measure twice, cut once” is a phrase we live by here. So what’s app the process? Here’s a brief overview of the stages an app can go through from conceptual idea to being in store for users to download. We’ve not included every aspect or detail, neither do we claim this method as a blueprint to follow… BUT…. it certainly works every time for us and our clients in producing high level mobile applications. The planning stage consists of a collaborative effort between our design/development/management teams and the client. Careful research on the marketplace and considerations of what to include in a high level overview are key. Once we’ve all agreed on what to include in the skeleton, a full and detailed specification for the app is created – again, collaboratively if possible, as the client knows their business far better than we do still! As part of this process and to begin the “fleshing out” process for the full spec, we create wireframes of all expected elements and screens within the app itself. Not only is this good for both our development team and the client (being able to visualise how things will work and be laid out) but also can flag up any potential areas previously overlooked in the app’s user flow. 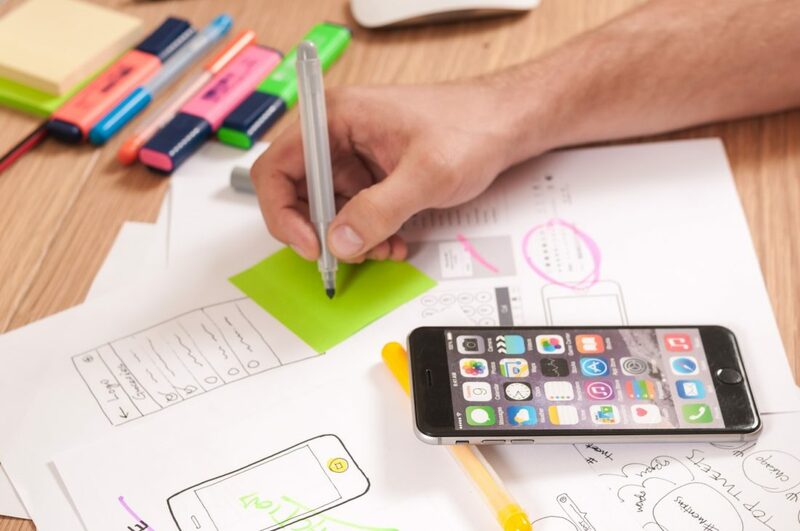 The app’s design, similarly to the wireframes, will ultimately decide the actual UI (User Interface) as well as have a huge impact on the UX (User Experience). At the design stage, we would generally create key screens from the app and liaise with the client on achieving the correct feel for the app overall. Part of this process, (should the client budget and timeline for release allow it) could include some A/B testing to achieve more optimal engagement/active user base after product release. Upon approval of the main elements/feel of the design on these main screens – the design team would then create the rest of app in pixel perfect, layered photoshop files – ready for the development team to build from. Whilst waiting for the designs to be completed, the development team will have already begun preliminary aspects of the backend, in order to hit the ground running once they have the elements for the end-user side. Our team of specialist developers (iOS, Android, DB/ROR) will then execute the scope of work we provide to all our clients in their initial project proposal. Throughout the development process we use project management software (such as JIRA, Trello, Basecamp etc) to internally monitor against the timeline, in addition to keeping clients up to speed with the progress of their product(s). This stage actually begins from the moment the first piece of code is written, as our development QA (Quality Assurance) team monitor the standards and usability of the build. We don’t wait until the end of a project to test functionality and stability of the product(s), as by this time there could be substantial issues which need addressing much further back. These regular appraisals of the build can also be beneficial in flagging up missing features or bottlenecks within the flow of the app which otherwise could be missed until release – again, saving time later in having to find a way to incorporate. We always encourage our clients to undertake some internal, or closed beta testing to select recipients at this stage too – as there’s nothing better than a fresh set (or 50 sets) of eyes to highlight possible improvements for the end user. The app is built – it’s been painstakingly documented, spec’d, designed, developed and tested. The only thing left to do is release… which, aside from the 7 day(ish) approval process on the App Store (iOS), is relatively straightforward. Sure, we’ll need to ensure you have the correct developer/seller accounts, screenshots and app info, but once that’s all done, you’ll be up and selling/giving away your app for free in no time! Now your product is out there and you’re watching the downloads rack up, you’re going to ensure it remains stable with any new OS updates or third party integrations…. Not only that, you’re also potentially going to want to add more functionality to it too – as your business and the end user demands grow. The simple and logical solution to this, is to build a long term working relationship with the team who originally built the app (hopefully us!). Not only does it mean that you have tried and tested the methods and communication routes during the initial project, but also that the team are already fully up to speed on the code itself, having lived and breathed it during the original build. If only there was an easy answer to this. Like the specs on a car, or the intricacy of a piece of tailored clothing – the cost will always come down to the time taken and the resources/materials used. Basically, the simpler the app idea, the fewer the screens and integrations, the cheaper the app is to build and test. Of course, this kind of ‘seems kind of obvious really!’ statement isn’t actually helpful on budgeting – but to give some idea, the lowest cost app we’ve ever developed (purely down to it’s simple functionality) was $1500 US. Generally apps take a lot more time and resources than websites – so if your budget doesn’t stretch to the thousands… then a mobile version of your website may be the answer at this stage. Because of the level of planning, design and actual coding, most of our ongoing app projects stretch into the ‘months’ and ‘thousands’, whereas a mobile website (depending on the functionality) can be up to 70% cheaper – albeit running on a browser of course, not as standalone software upon the mobile device. Please contact us if you have any questions or want to find out more of the differences between mobile websites and apps.